Or you’re just being an all-around sporting type. 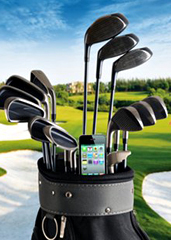 Welcome (maybe one day soon) 3D-Sport, a miniscule Bluetooth device that clips onto your golf club, board or other equipment and relays information and stats to your smartphone. The gist of it all is that within this thumb-sized gizmo are an accelerometer, a gyroscope and magnetometer that measure data like speed, power and distance. Then there’s the Bluetooth that relays this information to your smartphone. From there, an app on your phone overlays the data on a 3D video model so you can watch how you handled your club, board, bat or racket. With this at the ready, you’ll instantaneously get feedback and stats that’ll analyze your performance in uploadable form via email, Facebook and Twitter.